BlackBerry Messenger, Research In Motion’s (RIM) mobile IM application that uses unique “PIN” codes associated with every BlackBerry to connect RIM smartphone users, isn’t new. But due to the BlackBerry platform’s rising popularity, BBM–which you can think of as a mobile version of AIM or Google Talk that only works with BlackBerrys — is suddenly getting a lot of attention. And not all of it is positive. In fact, Web-security-software-maker McAfee recently posted a warning about BBM spam and hoaxes on its TrustedSource blog. To me, BBM is a valuable tool that I use every day for immediate contact with important colleagues, associates and family members. But the app can subject BlackBerry users to unnecessary risk if used improperly or without a certain degree of caution. Here are half a dozen BBM best practices to help ensure that you get the most of your BBM experience while avoiding any potential trouble. This is the most important point in my post, so I’ll say it again: Add new contacts sparingly.I know I’ll catch some flak from some of you loyal BlackBerry users out there who seem to be playing a game in which the goal is to gain as many BBM contacts as quickly as possible. But the value in BBM, for me at least, is that it’s not just another IM service–I have BeeJive for that. BBM users add new contacts in a few ways: 1) You can share your unique PIN with others and have them invite you, or vice-versa; 2) you can add new contacts by sharing e-mail addresses associated with your BlackBerry smartphone; and 3) you can “scan” other BBM users’ unique PIN-barcodes with your BlackBerry’s camera–assuming you’re using the latest BBM version (5.0). I only connect with colleagues, family and friends who I want to be able to communicate with instantly, at any time. And when I connect with someone on BBM, I mostly expect him or her to respond to my message as quickly as possible. And I know most of them expect the same in return.So, to the point: Do NOT share your BlackBerry PIN or barcode with just anyone; Do NOT post your PIN or barcode on your public Twitter account or any other social network; Do NOT include your BlackBerry PIN or barcode in your fixed e-mail signature. Are you getting the idea here? Good. Furthermore, you don’t have to accept all BBM invites you receive. (More on that coming up in the BlackBerry Groups section.) Don’t worry about hurt feelings or bruised egos. Your BlackBerry will thank you. 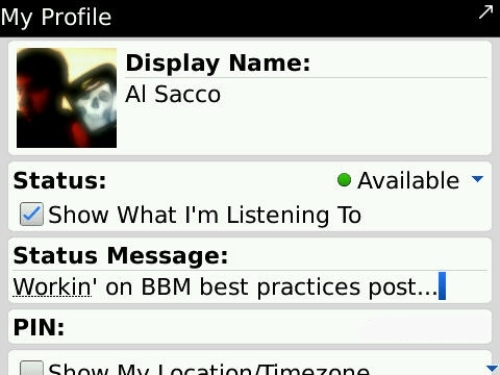 On that note: There’s really no right or wrong way to use BBM. But there are smart and effective methods of employing the service. Adding tons of contacts defeats the purpose of BBM for me and diminishes the app’s overall value. RIM’s latest version of BBM (v5.0) added a new feature that lets you manually backup your messenger contacts to your device’s internal memory or a microSD memory card. In the past, a separate, PC-based BlackBerry Desktop Manager or other piece of software was required for backup, but today the whole process can be device-based. In addition to the contact-backup option, RIM added a number of new features and functionalities to BBM in its 5.0 update, released late last year. 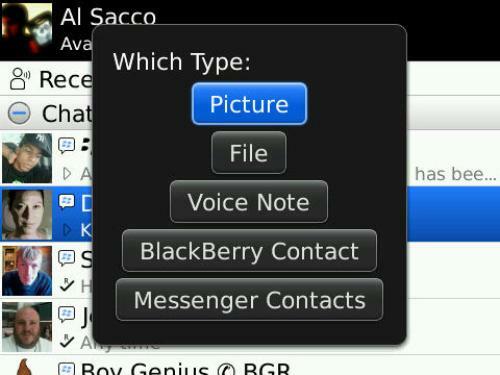 Among those features is a new BBM “Groups” option. BBM Groups, basically a mobile group-chat app, can be quite useful in coordinating disparate work-groups or for communicating during large conferences or events. The problem: It can also seriously affect your device’s overall performance and become both a nuisance and a time-drain. That’s because notifications are on by default when you join a new Group. And until you turn each alert off, you’re notified whenever a member of the group comments, posts an image or anything else. This can be frustrating, but it’s easy enough to solve that problem. 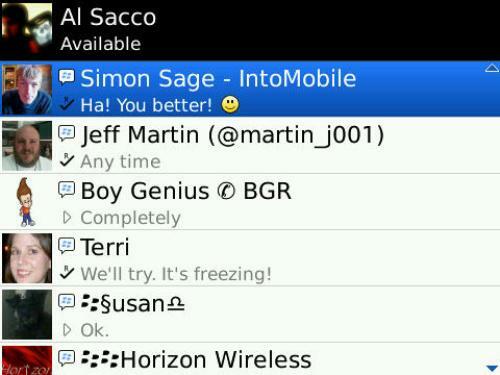 Just launch your BBM app and click on a Group’s name to open it up. 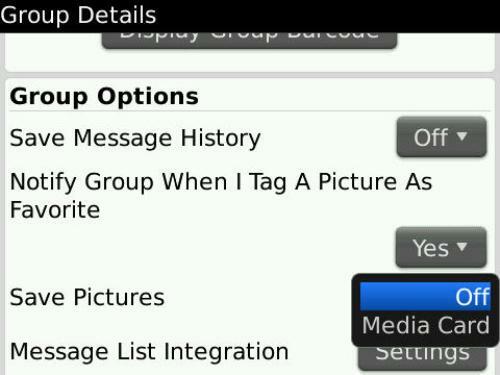 Then hit your BlackBerry Menu key and choose “Group Details” from the pop-up menu. You’ll then be able to modify notification and message-list-integration settings, as well as specify whether or not you want to backup message history, automatically save pictures posted by Group members and more. The two most troublesome things about BBM Groups, in my opinion, are the drain it puts on your device battery, and the fact that anyone who’s part of one of your Groups can choose to add you to their messenger lists. At one point, I was a part of three fairly-active BBM Groups and the notifications and refreshes alone nearly cut my BlackBerry battery life in half. As stated above, I purposely don’t connect with many people on BBM–I have fewer than 50 contacts at the moment. And the Group-invite feature also lets anyone else who’s invited to the Group by its other members add you as a contact. That means I have to ignore more invites than I would’ve without Groups. My advice is not to avoid BBM Groups completely; I think the feature can be truly valuable. But you’ll need to set your notifications and alerts wisely, as well as be wary of joining too many BBM Groups. If you follow the advice stated in the first section, this shouldn’t be too much of a concern, since all, or most, of your contacts should be “trusted.” But if you already have many BBM associates who you don’t really know, or by chance, you choose to pay no attention to my initial suggestion–shame, shame!–you’ll want to be cautious of the files that you accept via BBM. This should be elementary for most experienced Internet users, but all sorts of nasty stuff can be embedded in various common file types, including offensive images or audio and viruses that could affect your device or connected hardware. 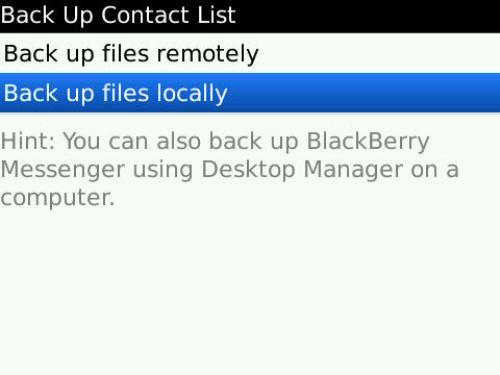 So before you accept any BBM file transfers, ensure that the sender is a trusted contact. BBM offers a number of additional privacy- and security-oriented features that you might find worthwhile. For example, you can choose to enable a security question on BBM invites, for an added layer of protection when adding new contacts. To do so, launch BBM, open your Options via the BlackBerry Menu key and ensure the “Display security question on invitation” option is checked. On the same screen, you may want to “uncheck” the “Auto-accept voice notes” option, to avoid unknowingly downloading potentially offensive or harmful audio files. And you can keep your location and current time-zone information private by opening up your BBM profile and ensuring the “Show my location/time-zone information” box is empty, as well. Open your profile by launching the app and clicking on the bar atop your display–the bar with your avatar image, if you’re using one. In theory, this sounds like a novel idea. But in reality, it proves to be incredibly annoying and obtrusive, mostly because some folks tend to overuse the feature. Like BBM Groups, I won’t tell you to never use BBM Broadcast Messages…but you probably shouldn’t. Okay, okay, it’s acceptable every once and a while, but please do so with some restraint. I know I’m not the only one who cringes when I see that purple Broadcast-Message-text in BBM….